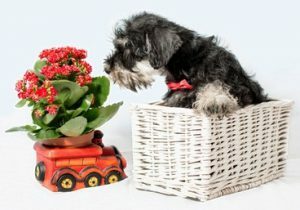 Toys for a Miniature Schnauzer puppy are not only fun to play with, they are an important and essential part of a puppy’s development of both mind and body. What better way for a puppy to get that stimulation other than a good supply of toys that are suited to the wear and tear that a puppy will give a toy over time. 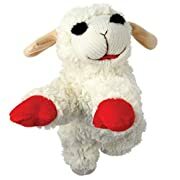 To be honest, I believe that we adults get as much, or more, fun from watching puppies with their toys as he or she gets from playing with them. Miniature Schnauzer puppies, as well as adult miniature schnauzers, will become bored if they don’t have enough activity in their daily life. A puppy is like a child; the very young need to have a lot of sleep. As they get older they need less sleep and more activity. If a puppy isn’t given enough toys to get the activity needed through play he will find something to use as a toy. This is likely to cause trouble in the home when it’s discovered that the puppy has all but wrecked the leg of a table or chair because of his boredom. Due to the need of activity and lack of toys to play with, puppy has done his ‘own thing’ and bitten into the furniture. This is a hard lesson to learn as a dog owner, but from the point of view of the puppy, he sees that chair leg tempting and off he goes biting it with vim and vigor. Hmmm….. not a nice experience to find the furniture destroyed. An expensive happening, to be sure! And be warned! Puppies also love things such as hats, cushions and perhaps the brand new knee rug recently given as a gift to a member of the family, but not meant for the puppy! However, it is colorful, as are the cushions and the hat left on a cushion. Oh what fun thinks puppy, these must be my new toys. Again, not actually fun when the wreckage is discovered! I’ve seen it happen in my own family! When buying the first toy for your puppy it’s a good idea to purchase a toy box. Your Miniature Schnauzer is an intelligent puppy. You can teach him to put his toys away in his toy box when he doesn’t want to play. I know that puppy putting his toys away sounds a bit much to expect. But I have seen puppies actually doing that. The thing to remember is that puppy knows where his toys are kept. He is able to get the them out of the toy box. Therefore it is possible for you to teach him, or her, to put their toys away. I’m not suggesting all toys will be put back into the right place, but teaching this is good for brain development. Toys for a Miniature Schnauzer puppy, and puppies of all breeds, should be carefully chosen. Make sure toys are suitable in size and do not have any sharp pieces or parts that could harm puppy. 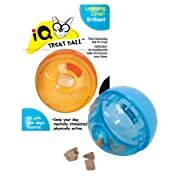 Check the toy is made of a suitable material that will withstand the wear and tear of puppy’s activities. In the case of a fabric toy, it’s good idea to check that the toy is washable. Each of the 3 toys appearing above have very positive customer reviews. These show that the toys are sturdy and loved by the puppies fortunate enough to have one of their own. Also, these toys are washable and excellent feedback in this respect appears in the customer reviews. 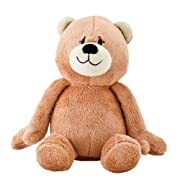 Customer reviews can be seen by clicking on the links below the image of each toy. Finally, enjoy watching your Miniature Schnauzer puppy playing with toys. Notice how development improves from interaction with toys that he/she loves and enjoys. Ruby has a little spiked ball (“rubber-type”), a similarly sized one for putting small treats into, a stuffed tug-toy (penguin, fur) and another (pig, nylon), a stuffed birthday cake, a braided red-n-blue thug rope, tennis balls, plastic squeaker toys. We have been keeping them “stashed” and renew the few she can have each day. I So like the idea of her having her own toy box. Thanks. I bet Ruby just loves those toys. They sound delightful and I’m sure a toy box for Ruby to place her toys in would be great.